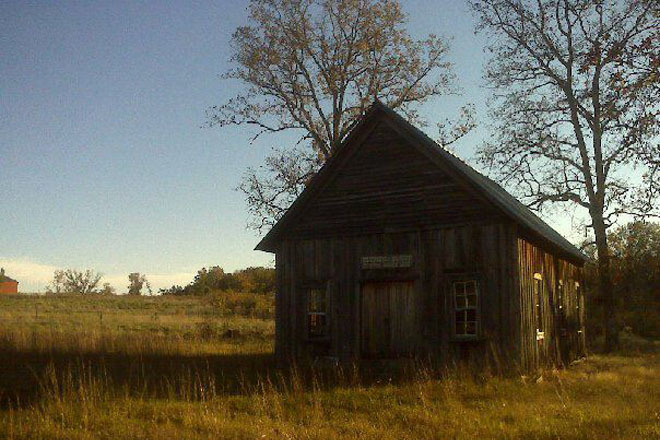 Our preservation efforts bring history to life with these DeKalb County landmarks. Built during the city’s industrial boom in 1889, Fort Payne’s Opera House is the only one in the State of Alabama still in use. The establishment has been used as a movie house, live theater, and a public forum. 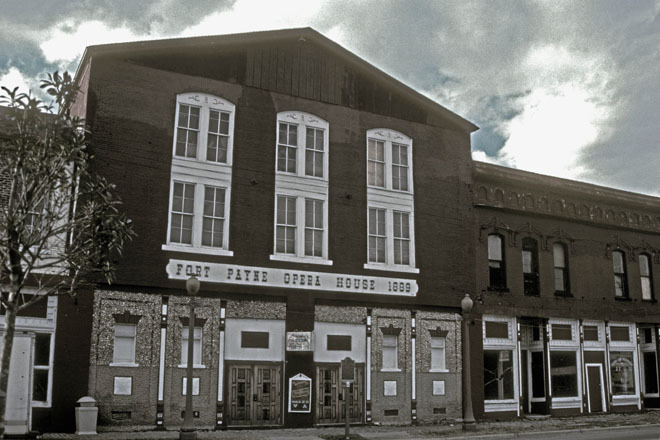 The Opera House opened in September of 1890 and was built during Fort Payne’s boom period. It was later converted during the silent film era, and then closed in October of 1935. Landmarks of DeKalb County, Inc. purchased the property in 1969 to protect and preserve the area’s history. They renovated, restored, and reopened the building to the public in 1970. The Opera House is the oldest theater in Alabama and is located at 510 Gault Avenue North. 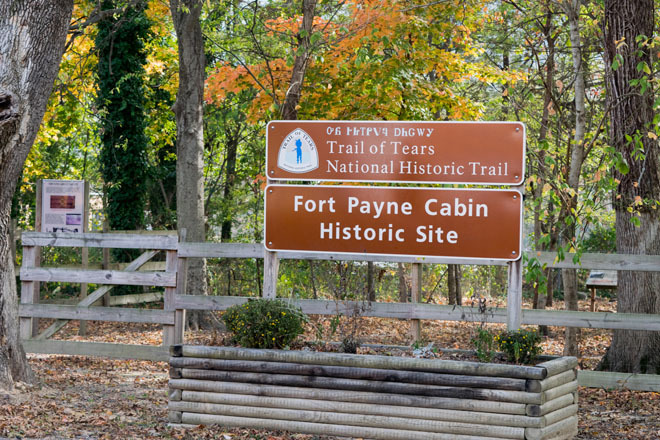 Dekalb Landmark’s property in Fort Payne, containing the old cabin foundation and chimney, is now an officially certified historic site on the Trail of Tears Historic Trail located at 106 4th Street in Downtown Fort Payne, Alabama. This interesting site is associated with the Benge Detachment during the Cherokee Indian removal in Northeast Alabama. The cabin itself was demolished in 1946 — it had stood approximately 125 years. The property has been deeded to Landmarks for restoration, and progress is ongoing but assistance is needed. Council Bluff has a new roof and plans for preserving the rest of the building are underway. 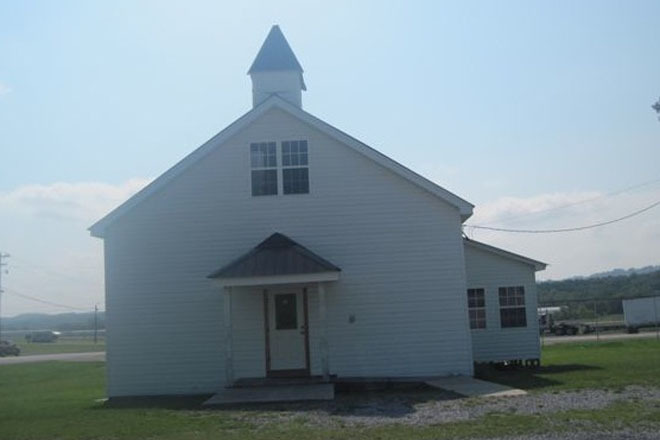 The Council Bluff School is located in a very rural area, down a small, unmarked road. Driving directions can be found on Landmark’s website. Located just off the intersection of 45th Street and Godfrey Avenue NE, the Andrew Ross home is privately owned by Dr. Stephen Brewer. 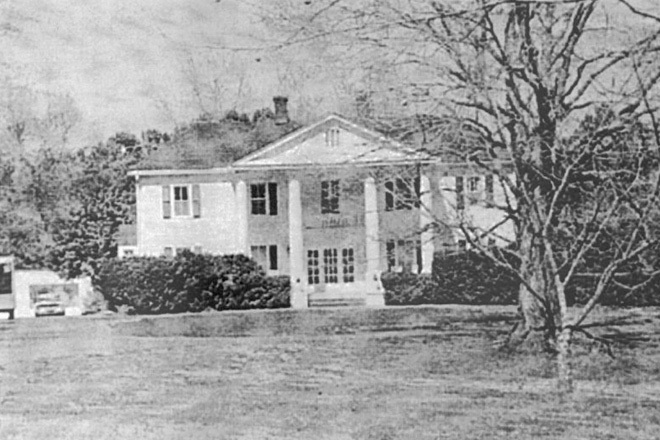 The present structure retains intact portions of the original home built in 1821 by Cherokee leader Andrew Ross and his wife, Susannah (Susan) Lowery Ross, the daughter of Assistant Principal Chief George Lowery. Long thought to be the home of Daniel Ross, Andrew’s father, recent research has revealed the home’s true origins. In addition to the home, which had an impressive second story balcony across the front, the property included stables, numerous outbuildings, farmlands, orchards and pastures. 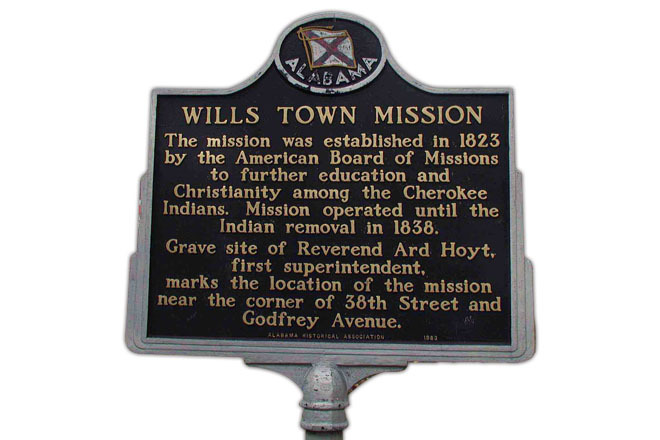 Historical markers commemorating Sequoyah’s invention of the Cherokee alphabet and the Willstown Mission are located in the Fort Payne City Park on Gault Avenue. Both are accessible by foot, close to the Alabama Band statues. 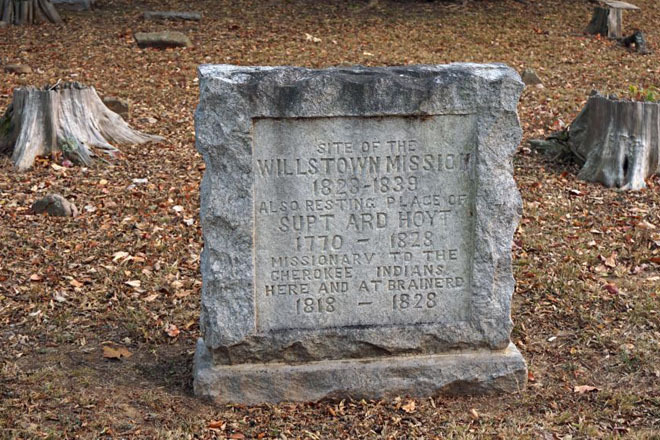 The mission was established in 1823 by the American board of missions to further educate and spread Christianity among the Cherokee Indians. The Mission was fully operational until the Indian removal in 1886. Visitors can view the grave site of Reverend Ard Hoyt, the Mission’s first superintendent. Today, the corner of 38th Street and Godfrey Avenue marks the location of the Mission. 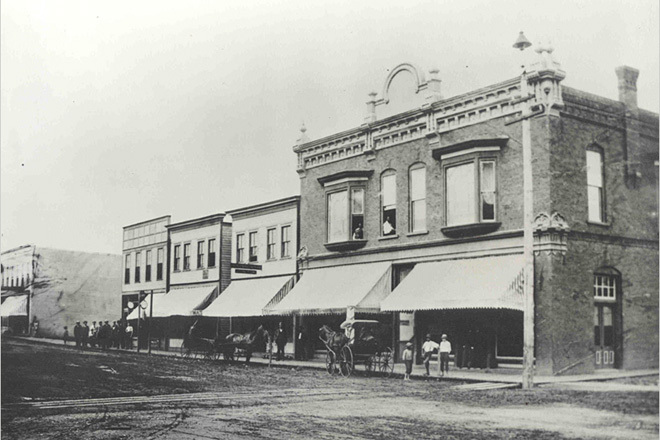 The Sawyer building was built in 1879 on the north east corner of Gault Avenue and Fourth Street North and had many occupants, including the Post Office, Alabama Power Company, the Water Office, Whaley and Burt Store and Myrtle Bigley’s Hat Shop. Today, it houses Boom Town Makers Market at the heart of the Arts & Cultural district on Gault Avenue in Fort Payne. The Civilian Conservation Corps (CCC) was a government- made work program during the Great Depression, a time of great suffering worldwide where jobs, money, & food were scarce. The CCC was developed as part of President Franklin Roosevelt’s New Deal, which was designed to bring relief to millions of unemployed Americans. 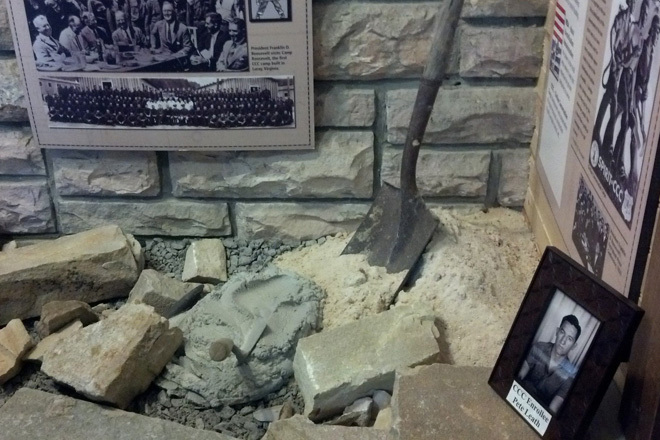 Few Depression-era work programs matched the success of the Civilian Conservation Corps. 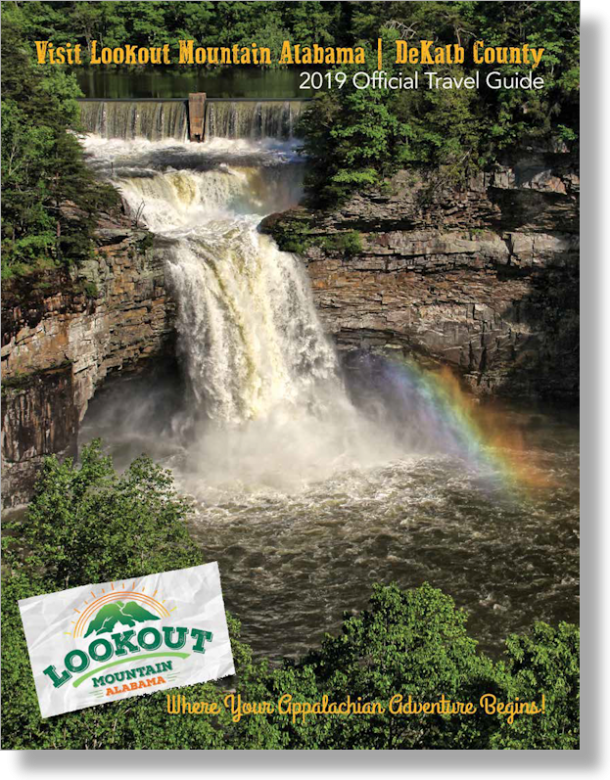 ; the CCC contributed to the preservation, improvement of fish and wildlife habitats, as well as the reforestation of thousands of county, state, and national forests, parks and campgrounds. The CCC taught valuable skills to these young men and provided America with trained, skilled labor when they left the CCC. All the hard work and effort of the Civilian Conservation Corps is still visible in many places throughout DeSoto State Park today. The CCC built roadways, trails, trailside shelters, DeSoto State Park’s Lodge, large picnic shelter, cabins, and even helped locals on several projects & buildings in the area. 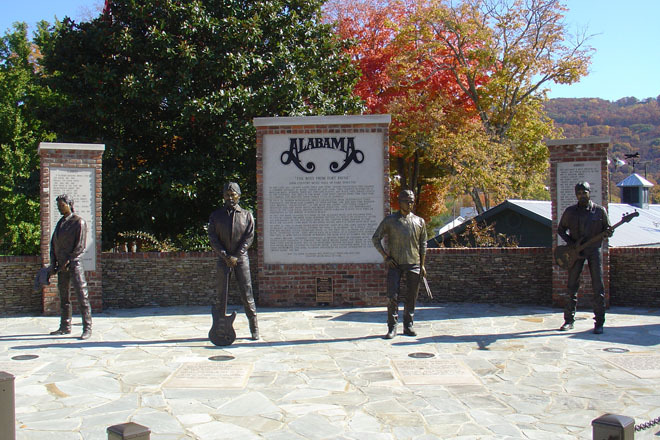 On the corner of US11/Gault Avenue visitors can view four life-size bronze Statues of the band Alabama. The monument to the 1980s country music super group greets visitors to the city park in Fort Payne, the band’s hometown.